Interpersonal skills are those which help a person communicate well. As the name says interpersonal, it means when the communication takes place between two individuals, then the communication is said to be interpersonal. The communication can take place in any form like verbally, non verbally, through gestures, through eye moments, different postures and so on. In order to make interpersonal communication successful both the people must have a common interest in field of experience. 1. Try to talk to as many people as you can. This is necessary because, the more you will talk to people, the more you will come to know about the knack of knowing and talking, hence the interpersonal skills will be improved. 2. Try to understand the interest and field of the individuals. This is also very important because unless you understand people, you will not come to know about them. The more you try and understand the background of the people, their interest and the foundation, the more easy will it be for you to communicate. When it comes to ‘what makes a good teacher‘, this is considered to be the most important thing. As no individual can become a teacher unless he or she is not able to communicate well. A teacher is required to share his or her experience with the students which demands interaction. More the interaction, more will be the successful communication. The teacher is not a complete teacher without best interpersonal skills including communication skills. What the teacher teaches must reach the students without any barrier. For this, a teacher must know how well to communicate to the students in a class. If the students are not able to respond, it means somewhere, there was an issue with the way of communicating. Not every student in class is equally brilliant. Some are slow while others are fast learners. Some catch the thing immediately, while others are not able to understand the concept in one go. In order to diminish such a barrier, a teacher requires good skills so that she or he can communicate and discuss the problems of students, bringing them out of their issues. A teacher is a bridge between the students and their parents. So, the problems of the students are to be discussed with the parents of the concerned students. For the successful discussion, the teachers require good skills so that what she or he has in mind is properly communicated. If the teacher is not able to make the concept clear to the class, the class may fail for the time; which a teacher never wants. For making a concept clear, the teacher has to make use of both verbal and nonverbal communication. The verbal communication includes the use of words which the non verbal refers to the use of hands and gestures. Both the verbal and nonverbal communication needs to be parallel to each other. Well, the interpersonal skill, not only includes the verbal and nonverbal communication; but also listening skills are vital to complete the communication. A teacher should be patient enough to listen what students or the parents say. If the teacher does not give anyone a chance to speak, then the possibility of misunderstanding arises and it leads to more issues and problems. So, in order to make a communication success, a teacher requires great communicative skills, to be more apt, interpersonal skills. Interpersonal skills are important for teachers to make a class lively than boring. The teacher shouting his or her vocal cord and no response is received in return, is not a two way communication or interpersonal communication. A teacher must have the skills to make a class interesting and this can happen only when the teacher possesses good interpersonal skills. 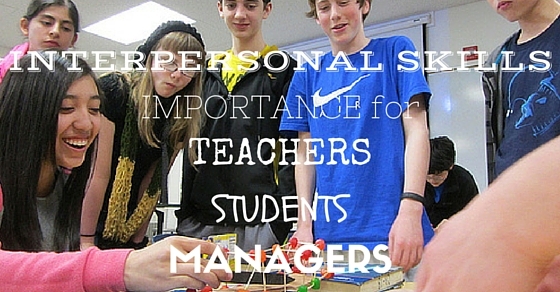 So, due to the above reasons, the interpersonal skills are important for every teacher. If a teacher does not possess it means he or she is not a good teacher. Even the student requires to have interpersonal skills. This is because, the communication is a never ending cycle and in case it ends, means it was not a great communication. If during the conversation or any discussion, only one person speaks, the other individual never replies, it means it is not a two way communication. Interpersonal communication needs two way process. When the teacher is teaching, the students are required to respond. If a student has any doubt related any subject, it can go away only when they communicate with the teacher. Any concept left understood can only be cleared by talking to the teacher. So, for the very important and the first reason, every student requires interpersonal skills. If one wants to learn something extra then what the receiver in the communication process is saying, one needs to give a feedback. A student should indulge in two way communication in order to learn the concept and clear all the doubts. Unless a student asks the queries, he or she won’t understand the matter well. So, for every student also, interpersonal communication is necessary. be cordial and understand. This is important because if a teacher does not have a cordial relation to the student, then the student may shy asking anything. Similarly, the teacher would not be able to have an open discussion. So, by this we come to know that a two way communication is very important when interpersonal communication is talked about. The feedback or the response from the receiver is must to complete a communication. Not every student is extrovert or socially communicative. So, if a student is an introvert, he or she must start with speaking. One can start with the class itself. Putting forth the doubts and the queries related to the concept is not a bad idea. This has become the first step towards achieving excellence in interpersonal skills. So, every student in order to develop such skills, start with this step of talking, asking and putting the question “why” in front of every teacher. A person can become manager only when they pass the various steps of interviews. The interviews nowadays not only include the scrutiny of resume, but also the various other aspects is taken into the account. An organization’s norm changes very often. Also, it could not be denied because it is needed for every small and large scale organization. When any change is to be bought with the organization, that upcoming change is necessary to be communicated to the employees. If it is not done, employees may fail to know the changes to be bought. So, to let know every individual about the change to be brought, interpersonal skills are vital for every manager to possess. What is decided by the managing team in unison must be communicated with the employees of the organization. This is the only way by which the lower authority will come to know about the decisions from the highest authority. The managers need to have good communication skills so that he is able to solve all the conflicts taking place in the organization. The small conflicts, however, can be solved by the employees only, but when it comes to larger conflicts, the managers have to come forward for the same. The managers need to communicate in a manner that the conflict gets solved instead of getting immense. So, for this purpose also, good interpersonal skills are necessary. The managers not only have to sit and order the lower authority, but they are responsible for group commitment also. The managers if will have good communicative skills, be able to communicate the commitment needed to work. Also, they are the motivating voice behind the good effort by the employees. The manager speaking skills can motivate even a demotivated person and influence the minds. The tone and the way of speaking can influence an individual’s mind to a larger extent. So, the interpersonal skills must be very strong for every manager. The managers at times have to criticize the work of the employees and even have to praise in order to motivate them. Both are important for the growth of an individual. This can be done in a sugar coated manner so that both ways the employee does not feel bad. For this, one needs to have an excellent speaking skills;specifically interpersonal skills. The employees may go astray while working. So, it is the duty of managers to help them move out of this trouble. This could be done only when he or she is able to communicate well with the employees. Also lends his or her ear to the employee. Listening is also part of interpersonal skills, so the manager must also have a patient ear to hear the grievance. During corporate meetings, the managers are required to speak out the policies, the changes in them in a manner which is understood to everyone present there. If the manager will not be able to communicate properly, it will leave the employees mulling over what the manager was trying to say, which is the result of poor communication. So, every manager needs to possess the interpersonal skills so that the meetings go well and what was intended is communicated accordingly. It is the manager who has to communicate and then help implement the plans of the company among others. The proper communicative skills will do much good both to the company and the employees. So, it is better and must for the managers to possess good interpersonal skills. The managers must know the knack of using apt words at the right time. It is the words and it’s presentation which matters. This is what actually completes interpersonal communication skills for a manager. What he or she will speak decides the behavior and the end result of the employees. Not just this, it also helps in developing credibility among the employees. So, above are some of the points which explain why interpersonal skills are necessary for the teachers, students as well as the managers. The interpersonal skills are important in every stage of life because at every moment we meet someone or the other and we speak to them. It is due to that interpersonal communication that the conversation continues. It is vital to take into consideration the field of experience of the individual whom you will be talking to. If the field of experience differs, the communication may come to an end.